After what may have been a long search for the home of your dreams, you've found a place you want to buy. Great, so what's next? Taking the property off the market: You may decide, or be advised, to pay a small deposit OF 3000 EUROS, to the estate agent, acting on the behalf of the vendor, to take the property off the market for an agreed period, while your lawyer does due diligence before signing a private purchase contract. Ideally, prior to paying the 10% deposit, your lawyer should confirm with the Property Registry (Registro de la Propiedad) the property appears under the seller's name, there are no liens, charges, or legal impediments, and the description reflects reality. The contract should also let you recover your deposit, after signing, if unforeseen circumstances (like hidden charges or structural problems) make the deal inadvisable. If the sale goes through, the deposit forms part of the purchase price. Agreeing terms and a completion date: Some buyers skip the deposit and immediately sign a private purchase contract with the vendor or uthorised representative, normally also paying 10% of the agreed price. A private contract identifies both parties; describes the property; details conditions of sale, price, form of payment, date of signing of the public title deed; and stipulates how expenses and taxes will be paid and by whom. Once signed, this is binding for both parties. Prior to signing, your lawyer will need to examine the title deed, ensuring the seller is the registered owner and has no impediments to sell; verify that details in the Property Registry and Land Registry (Catastro) match and there are no outstanding taxes or other charges; and confirm the town hall (Ayuntamiento) has no planning issues or other charges. Once the legal situation is clear and the vendor's right to sell is confirmed, you can sign a private contract. Prior to completion, you, or your lawyer, should also ensure the following taxes are all paid up to date: Municipal property tax (IBI) and rubbish (basura), for the last four years (ideally, get a certificate from the town hall stating there are no unpaid debts). Withholding tax (retención), if the seller purchased from a non-resident Special lien (gravamen especial), for the last four years, if the seller is a non-resident company Municipal land tax (plusvalía), if the seller is a non-resident individual, as the Tax Office (Hacienda) can claim this from the buyer.If the property is in a community, you should ensure the seller does not owe any fees, by obtaining a certificate from the president stating no outstanding payments are due. If not, you may be liable for the current and previous three years. To complete the sale and become the new owner, you also need a NIE number (número de identificación extranjera). This is the foreign identification number necessary to pay taxes and do paperwork with the Spanish Inland Revenue. 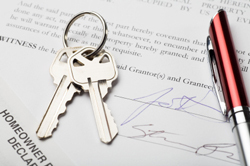 Both parties need to sign the public title deed before a notary, who testifies to their identities and sets out the terms of the sale, including the description, price, and payment details. Once this is signed and payment made, you will receive the keys to your new home. Finally, you need register the transaction with the Land Registry to have maximum protection against claims by third parties.